Chaffin Family Orchards is located in Oroville, CA. Chaffin briefly opened agro-tourism as part of their farm offerings. They collaborated with Feather Down Farm Days to install 4 farmstay cabins. The early-1900′s-style pre-electric tent cabins include a bathroom with composting toilet and full kitchen with woodburning cooking stove. In need of greywater to handle the waste water for their cabins they asked us to design the system and they installed them for each cabin. 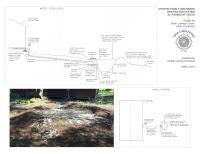 Greywater from cabin showers, sinks and the kitchen enters the mulch basin through a pipe which is located within a covered box.